Three day fishing trips aren’t the normal overnight trip if all you want is just Tuna Fish and maybe some Dolphin (Mahi-Mahi). With only six anglers on board we headed out on a Thursday afternoon for a three night, three day trip. It’s not normal to leave that early in the afternoon and then run all night, but when you have three days to do it in, you just don’t need to get in a hurry. 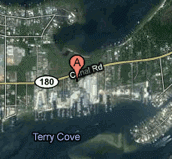 We left Orange Beach from Sportsman Marina around four pm and headed south around 10 knots. The seas were between 3-5 ft. with an occasional 4-6 ft. coming out of the south east with a 15-20 knot wind. I know it sounds bad and it was but this was actually better conditions than what they said it was going to be. For the first five miles or so out of the pass it was pretty rough and then it spread out and got a little smaller which made the ride tolerable but not comfortable at all. We just knuckled down and dug in for a slow ride and before you knew it we found ourselves in the dark and the boat wasn’t rocking near as much, Thank the Lord. That was pretty much the worst of the whole trip and it was behind us now. It got nicer and nicer for the next two days till it was as slick as a mill pond with hardly a breeze of air. We traveled out at night for around eight hour s till we came to one of the offshore rigs that usually hold good fish so we stopped and checked it for some sign of life by Jigging for Tuna under the lights. The rig didn’t show much on the fish finder but we tried it any way and ended up catching one Black Fin Tuna. So, we headed on to the next one further out about 15 miles. Now it’s around 3 am in the morning and everyone is unconscious, except me. Once we got some coffee in us, it was game on! First line out, “Fish On!” We ended up catching a couple of huge Yellow Fin Tuna on live bait and chunk fishing. The fish bit all day pretty steady, our problem was keeping a fresh and lively angler on the business end of the rod, seems that the ride out and the long hours of the night took its toll on the crew. One of the best parts of these trips is the meals on the Big Green Egg. These guys have some buffalo Hamburger and I’d never tried any before. “Delicious!” Being the red meat guy that I am, that was awesome, not to mention the Prime Sirloin another fellow brought from Brazil like they serve at “Fogo de Chao” original restaurants. We ate like kings for three days. Sausage on the grill for breakfast, Buffalo burgers for lunch, rib-eye steaks for dinner, and like a good deckhand does, we had some cookies and cream ice cream for desert that he brought just to make sure we had all of the comforts of home, you know! We wrapped up our trip with some 4-5 lb Mingo’s and a limit of 40-50 lb Amberjack to go along with a box full of Yellow Fin Tuna, Black Fin Tuna, Skip Jack Tuna and a couple of Wahoo in the 40-50 lb range. Yes, we did catch some huge Gag Grouper which do not open until July 1rst. and we properly ventilated and released them after taking some great pictures. It turned out to be a great trip for everyone, even the couple of guys that didn’t see daylight for about 36 hours. They have already booked a trip in the fall for another overnight Tuna trip. Party Boat Fishing in Orange Beach and Gulf Shores on the Emerald Spirit. Today we had a six hour party boat walk-on trip. The weather was a little over cast this morning with a good breeze out of the north, along with a 2-3 ft. swell out of the south southeast. We left at our usual time of departure at 8:00 a.m. and went out to the area we fish around 20 miles on the natural bottom or rocks of coral. On our way we noticed that there was a lot of the sargasso grass on the beach and in the water. Some of it made up real nice grass lines which hold bait and then draws in other fish like dolphin, Wahoo, tuna, king mackerel and other top water fish. Wouldn’t you know it didn’t take long and there were reports from other fishermen that they had caught some black fin tuna on the weed lines while trolling out to their fishing holes. We didn’t seem to get a line out to troll, but we did get a drift line out when we stopped to fish. The mingo’s and white snapper were biting real well. After fishing a couple of places and moving around we got a big bite on the drift line and a big fish on a two hook rig at the same time. Not knowing what either fish were till the one on the two hook rig popped up did we know we had two black fin tuna on at once. I guess you could say the fellow with the two hook rig applied too much pressure and lost that one but we did manage to get the other one in the boat. As Murphy’s Law would have it the same fellow who lost the first one, hooked a second one before they got the one on the spinning rod in and he lost the second fish he hooked as well. It was pretty exiting the for several minutes to say the very least, one person going around the boat with a spinning rod and another in the back hooking up and losing them faster than you could tell what was going on. Nevertheless, we are grateful to get the one we did. Now I can’t wait till tomorrow, we’ll be ready. Today we had a Six hour trip with 31 people on the Emerald Spirit charter boat. A good trip with a decent amount of people without being crowded. Every morning we have a Safety meeting and a fishing instructional before we pull out of the marina. We cover and discuss things like where the life-saving equipment is located, where the bathrooms are, as well as the dreaded sea sickness and what NOT to do. Part of the speech also covers rod and reel instructions, how to be safe with your equipment. The last part I go over is how we fish as a team to be more efficient. The primary rule is to have fun and enjoy the trip and we all know that an injury or illness is never any fun so we give as much information as possible to safeguard against any trouble. Being well informed is part of a team effort. Our team of deck hands attends to every need of the customers from parking the car all the way thru the day till they get their cleaned fish in a Ziploc bag with some ice for their cooler. This same group of guys work together on the way out and on the way in every day as a team to get somewhere between 15 and 50 rod and reels ready to fish with new hooks on a new rig every day. On the way in they de-rig and re-rig all the rods we used that day and spray and wipe each one down with an anti corrosion lube so they stay in perfect working order. Also in order for us to have hooks every day and bait in the freezer and bottom sinkers there has to be a team effort to tell someone in charge that we are low on supplies so that person can make sure supplies are provided. Everything has to work efficiently and smoothly, as a team we get it all together and provide a service that resembles a close knit family. We want your trip to feel like you were out with good friends and family enjoying the day. As I say in the speech each morning, “Believe me, you’re better off fishing as a team”. We were fortunate enough this year to be asked to participate in the effort to give back to our soldiers who have been injured, and proudly said yes to the opportunity to take a few out for an outstanding day of deep sea fishing on the Emerald Spirit. Our day started like all the others; get down to the boat early and catch live bait, make sure all of the tackle was ready as well as the boat. The Crew is ready all the time, especially today because they know how important this is to everyone involved. They also know I was going to go to some of my very best holes in the Gulf. We had a couple of sponsors pay for the Wounded Warrior Project to bring these guys out with us today. It is this kind of dedication as well as the dedication of our troops that really got to me so before we ever left the dock in Orange Beach I gathered everybody in the cabin for our safety meeting and proceeded to share with them my plans for the day. I explained how we normally fish and how I wanted to fish today, which is out of our norm somewhat. I call it “Hero or Zero” fishing. We basically do what you never do and that is go to your poor holes or ones that just don’t have much on them. Then we use the biggest bait you’ve ever seen, so big it would choke your average monster fish. I know, sounds crazy, Huh? The way I see it, you will probably bomb out and not get a bite at all, BUT IF YOU DO! OH YEAH! Well we didn’t do too well in the Hero or Zero department so we just went to some of my 5 year old virgin fishing holes where the 25 pounders swim around on top and bite like a bass hitting a June bug! We didn’t keep anything less that around 20 pounds or so, and the water was real muddy. We did put out the drift line and finally got a bite, Wow, a 53 pound Wahoo. We also caught an 8 foot Bull Shark and everyone got to pull on him a while. Once everyone was tired I was told to take it in. As we headed for home one of the warriors of the trip who had fished his tail off all day turned to me and said, “I’m sore all over!” and I thought, what a good job I did putting them on some big fish. Then I talked to one of the sponsors and told him what the soldier said and he explained to me, “You know that 80 % of his bones in his chest, shoulders, arms and back were broken when an IUD blew him up?” All I could say was Oh my God! You would have never known, he fished like he never had a problem and will most likely be stoved up for a week or so getting over the trip, yet all of the guys thanked me personally and that I’ll remember for the rest of my life. Hopefully, we can do this again for our veterans. Thank you for coming! It’s Saturday and we got one of our favorite customers on board for a 12 hour trip of deep water offshore fun. The best part about this trip is that all off the people on the boat are in some way involved with the restaurant business. My friend Marco makes this thing called a “Frittata”. It is delicious! It’s is like a giant omelet with sausage, mushrooms, cheese, potatoes and I don’t know what all else all mixed in a scrambled egg deep dish pan. Awesome! I know what’s for lunch when they come. As usual, we went out Saturday and started with catching our Mingo’s, Triggers and stuff and moved offshore for some Amberjacks. As we went out farther the current got pretty strong on a few holes we stopped on and I heard some of the other captain’s complaining about how hard it was to hold up on the spot. I started to fear the worst for fishing in the deeper water we were headed for, however I noticed a huge tide line on the horizon a mile or so out in front of me and figured I was going to stop just beyond the line. To my surprise we passed over the line about 500 yards and rounded up on the hole and I darn near ran slam off of the hole thinking it was like it was on the last hole. Thank goodness it was dead still. Cool! What a relief, I won’t have to fight the current or massive tangles in the deep water. After checking the spot we stopped on and catching some big Mingo’s and several huge Triggerfish we went on out for some Amberjacks. I wish I could say they just jumped in the boat but that isn’t what happened. We had to work for them. Maybe that current wasn’t moving on top but something had them spooked a little. We caught a few here and there and ended up hitting one really good hole by luck in the end. I know you’re thinking, “He was saving that one till last” but I wasn’t. I’d rather be lucky than good on a day like that. All’s well that ends well. We had a great trip when it was over; I just had to work a little harder. Saturday morning brought an opportunity to us that we don’t get to often. We took the Gulf Shores Baptist Church out for a small in house tournament of the men of the church. All were welcome to come from any age. Its part of a chance to get fathers and sons together and fellow church goers to get out doors and share the beauty of God’s creation. Not to mention that it’s a chance to catch some fish to eat. We met at the dock around 6:45 a.m. and left out around 7:00. After some coffee and donuts we were on our way. We only had six hours for our trip so we hurried out to the fishing grounds and before we started fishing we said a prayer… From the first drop the fish were biting two at a time. Reverend Lloyd even caught two at a time. We didn’t have to move but one time to a different hole a few hundred yards away and they were biting again good. Then it happened, first one then another and we had two Sharks on at one time. After fighting the one for around 15 minutes or so the line parted. However, the line on the other was as strong as our faith and we fought him for around 25 minutes until we got him up alongside the boat were everyone could see and get a good picture and then we released him to live another day. We resumed our fishing for what little time was left and then headed back to the dock. It was a very good trip and I think everyone enjoyed it, maybe with the exception of a few who let’s just say took full advantage and then some of their sea sick patch’s, no names mentioned but, Amen. Well they say a picture is worth a thousand words and if that’s the case then this one speaks volumes. We left out on Saturday morning with a live well full of pin fish, Cigar minnows, Croakers, Hard tails and some menhaden. 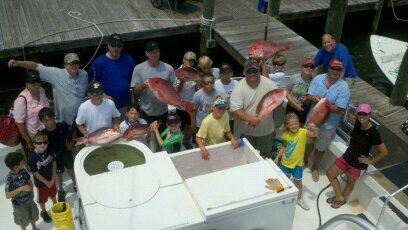 Our first stop was as usual for some other kinds of offshore bait like small White snapper and Small Vermillion snapper. After getting the live well so full that you can’t see into it but about 6” we went on out to try some deep water bottom fishing. From this point on it seemed that we were on a mission that could do no wrong. When we stopped on our first hole the 4 pound Mingo’s (vermillion) Snappers were on fire. Everyone was catching 1 or 2 on each drop using a small piece of squid on a two hook rig. However, the best thing was that for every 5 or 6 Mingo’s we were getting a nice 6-8 pound Scamp on a live pinfish or croaker. Unbelievable, could it get any better than this? We did this on every hole we stopped on all the way out to my secret Amberjack hole. As we approached the AJ hole my guys rigged up quickly for the battle that was fixing to happen. They cleared the deck of the two hook rigs on the Electric reels and got out the heavy lined 6/0 reels. Once we pulled up into position and I gave the command, it only took 45 minutes to get our two day bag limit of the 35 to 60 pound Amberjacks. We never missed a beat. As everyone were high fiving each other I headed on out around 4:00 p.m. to the offshore deepwater oilrigs for some tuna fishing action. We arrived with anticipation and excitement of what was to happen next. It certainly didn’t disappoint. As soon as the lines were in the water we were on. A small Black Fin Tuna and then another, and then another and another. After a few laps around the rig we saw what we came for, the Big Yellow Fin Tuna busting the water on top just out from the rig a little and heading right to us. As the tension built up we crossed over the school of fish and all eyes were on the lines. “Fish On, right rigger!” then “Fish on Left rigger!” OH Yea! They were biting! We fished into the night, jigging next to the rigs as the seas built to 6-8 feet. We got up the next morning around 3:30 a.m. and started it all over again. Before it was over we had 4 Yellow Fin Tuna, 25 Black Fin Tuna, over 40 head of Scamp, around 180 head of Jumbo Mingo’s and 24 Amberjacks Totaling a little over 2,000 lbs. Wow! 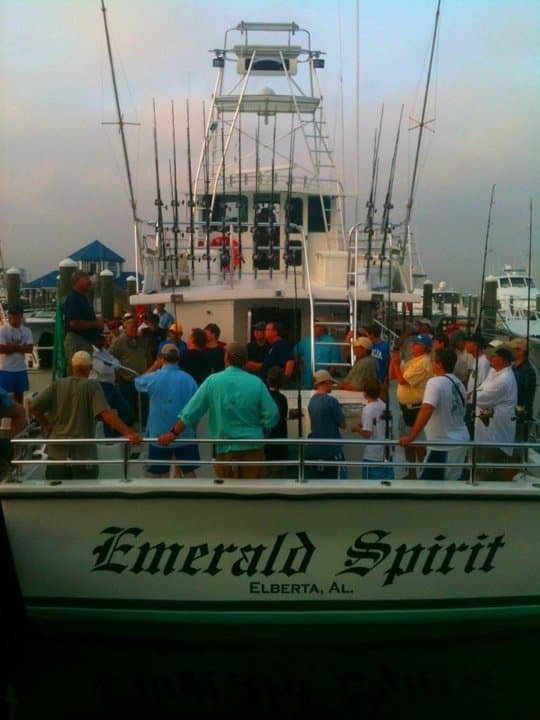 Once again we are riding the Emerald Spirit out for a day of fishing in the beautiful Gulf of Mexico. We had 10 hours to get it done in the same fashion we usually have 12. The first stop was on the rocks offshore for some Vermillion Snapper and white Snapper with the chance of getting some other good bait fish with them. The first place I stopped was on fire. We caught real nice Mingos and whites one and two at a time. Before you knew it we had limited out for the Vermillion Snapper at 10 per person. After that we decided to go a little deeper and try some Amberjacks and maybe a Scamp or two. I traveled about 3 or 4 miles, just enough time to let everybody get something to drink and let the deck hands regroup for the jacks with heavier tackle. We arrived to the hole and prepared to drop four lines at a time. You are allowed to keep one fish per person so with seven anglers I figured it wouldn’t be long for each person to tag out and pass the rod off to the next guy. Boy do I love it when a plan comes together. We dropped four baits and immediately were on with four big Jacks. We tagged out with the rods to the next anglers as the fish came in and in no time we were done, limited out. They brought up Yellow-edge Grouper, Snowy Grouper, Scamp and to my huge surprise some of the most Monster-size Mingos we’ve ever caught. No kidding. They were 5-6 pounds a piece. So I told them to grab the two hook bottom rigs and drop them for some Scamp right there on the same spot. Sure enough we caught a few but it wasn’t what I knew we could do so we moved to our third hole of the day which was even deeper than the last, now we are in 290 – 310 feet of water. As I rode down to the next spot I was remembering the last time we fished there last season and it dawned on me that we caught some deep water Grouper there. I told the deck hands to get ready for some of those and we’ll try it. When we got there every one was baited up and ready to drop. You have to be ready to drop when I tell you, especially in the deeper water like this because it’s sort of like precision bombing, everybody has to go down at the same time to avoid tangles and to assure you hit the target. We dropped and it didn’t take long to see we hit the target good. Everyone got fish on and I knew we made the right decision. They brought up Yellow-edge Grouper, Snowy Grouper, Scamp and to my huge surprise some of the most Monster-size Mingos we’ve ever caught. No kidding. They were 5-6 pounds a piece. It was a good thing the deck hands used up some of the other b-liners we had for live bait earlier because I would have died to have to throw those back. That’s when I realized it was time to go home. Three stops and we put the mash down on them. It doesn’t get any better. I can’t wait till next week when we go on our first overnight Tuna trip. 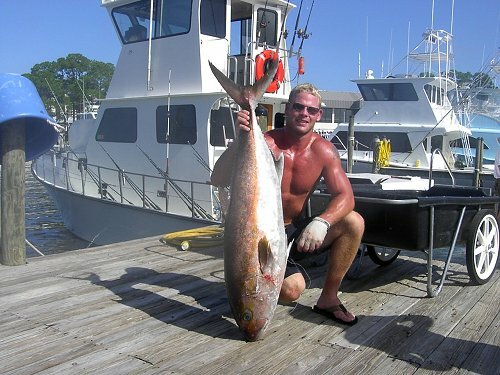 The reports are great offshore and there are plenty of nice fish, we’ll check it out. 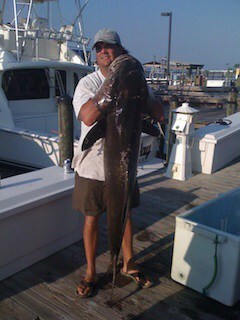 We are in the beginning of Cobia season and have been fishing for them. Cobias are a migratory fish that come through our area usually April and May. They are fished for by sight where you ride in a tower and look for them and then throw a lure or live bait over to catch them. They are very good to eat and usually pretty good size. The Emerald Spirit was getting some improvements and out of the water for 52 days painting the bottom and re-doing the decks. We also put new railing all around the boat with rod holders and a place for your weights. It looks awesome and we’ll have some photos up shortly. As soon as we got in the water we did a small test run out for some Cobia for a couple of hours and saw 2 Cobia, both with other things on there mind. Then we got to go out the other day on a one-day tournament to benefit Capt. Mo Schavers who owns Mo Fishin Bait and Tackle Shop in Orange Beach, Alabama, There was a one-day tournament with half of the money generated going towards some hospital bills he had incurred so we gladly entered. We left the dock around 6:00 a.m. and returned around 6:00 p.m. We left out of Terry Cove, through the Orange Beach Pass and fished all the way to the other side of Pensacola Beach, Florida’s fishing pier. (Yep, we’re licensed in both Alabama and Florida so we can go that way!) On the way down there we saw 2 fish that were real nervous and wouldn’t bite. Then a couple of hours later we saw another fish who was a little more interested than the first two but still not hungry. Finally we saw a good fish around 45 or 50 pounds and he was more interested in our baits than all of the other but still wouldn’t eat any thing we threw at him. We did see another fish later, but he was like the rest, not interested. The weather was great, the sun was popping in and out of the clouds most of the day but we had a great time. I hear there are a bunch more Cobia headed this way and we will get to see soon. First we have a little getting ready for our annual United States Coast Guard (USCG) Inspection. After that you’ll be hearing from us again, hopefully with a better report about how many we put in the box. 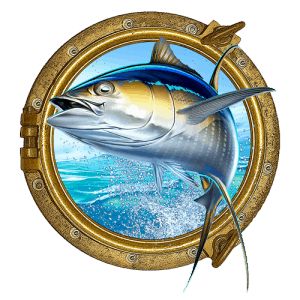 The Christian Brotherhood of the Gulf Coast presents the Fishers of Men Fishing Tournament. All proceeds from this tournament benefit GOD’S WORK through and hosted by First Baptist Church Gulf Shores Alabama Outreach Services. It will provide assistance to victims of child abuse, assault and domestic violence ,churches and families needs and also provide education in the (CDC) school, 831 House and other areas throughout the community to raise awareness of GOD’S WORK. $20 Per person DONATIONS before April 1st – $30 after April 10th Everyone that is registered by April 1st gets a FREE T-SHIRT Breakfast & Dinner. WEIGH-IN PREMISIE WITH YOUR FISH BY 4:00 PM. WEIGH IN LOCATION IS: SPORTSMAN MARINA, GULF SHORES MARINA, ALL FISH CAUGHT WILL BE DONATED TO THE FISHES & LOVES FEAST OR AS NEEDED AT FIRST BAPTIST CHURCH GULF SHORES. • Each fish must be weighed in by the Person who caught it. • Fish that are not fresh or in good condition will be disqualified. All decisions made by the Weigh master and/or his assistants are final. 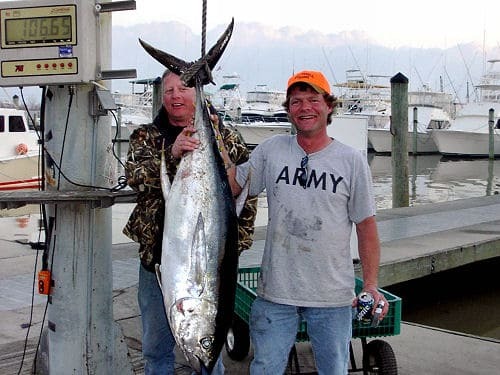 • All fish MUST be caught during the tournament hours on hook and line in Federal or state Saltwater’s. • Only legal Redfish (16″Minimum with pinched tail) will be weighed in the tournaments. • No flounder less than 12 inches. No Speckled Trout under 14 inches. • NOTE: ANY category fish may be weighed in as a Big Fish Contest entry (1.) Redfish ( 2.) Speckle trout (3.) Flounder (4.) White trout (5.) Sheephead (6) Bluefish (7) Croaker (8) Trigger (9) King (10) Cobia,. • In case of a tie, the first fish weighed in wins. • Participants shall fish at their own risk and should use good judgment when and where to fish. • Competition is open to all Churches members AND GUEST (with paid registration prior to tournament day) For their spouses and children under 16 years of age. • PLEASE make a note to the Weigh master of YOUR name and phone # when you & dependants (spouse or children) enter a fish. • For our BROTHERHOOD tournament the top places in each category must be present to receive Awards at the FISH & LOAVES CELEBRATION DINNER FEAST after the official weigh in. FISH ALABAMA STATE & FEDREAL SALTWATERS BY BOATS, PIER, SHORELINE, KAYAK, Open participation to everyone! Bring your friends! More information can be found at http://www.fbcgulf.com.